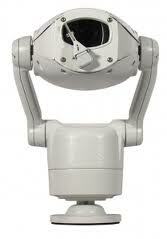 We have heard that 360 vision technology are releasing a new predator camera into their range. We have seen the Predator camera before and it is a robust quality piece of kit.The predator comes in several different formats including IP, night vision with IR and of course thermal. But now something not seen before as we as we know, a CCTV camera with a spot light. Its actually called the White Light predator. What a great idea when you think of the deterrent value something like this can bring to a CCTV system is surprising that no one thought about this idea years ago! So how does it work, well to be honest its so new we don’t know but we know it uses high powered led technology and this can either be manually switched on by a security guard or can be programmed to automatically to come on with alarm presets. So you will get a crystal clear night time image and deterrent that will deter criminals as they attempt to break in. No one in there right right mind will continue to perpetrate a crime while under the watch of a spot light especially as this spotlight will track there every move within the protected area. So to any specifiers out there who need a camera that looks good, that performs brilliantly and offers unprecedented deterrent value. Keep your eyes open for the Predator complete with spotlight………… it certainly is an illuminating idea! This entry was posted on Monday, April 4th, 2011 at 05:15	and is filed under CCTV. You can follow any responses to this entry through the RSS 2.0 feed. Both comments and pings are currently closed.